We’ll provide some insights and review some of our DFS value players for week 11. Lamar Jackson (BAL) – Salaries: DraftKings (DK) – 4700, FanDuel (FD) – 7000. Jackson’s upcoming salary ranks him 28th/21st on DK/FD, respectively for the position. The betting lines with the Bengals are currently off the board as the status of QB Joe Flacco (hip) is unknown. The Ravens are coming off their bye. The Bengals’ defense give up the most fantasy points allowed to QBs, and the 3rd most fantasy points to ALL the other offensive skill positions. The Bengals’ defense also ranks 22nd in DVOA against the pass. The Bengals also give up the most passing yards with 313.3/gm, the 2nd most rush yards with 142/gm, and the 2nd most points with 32.0/gm. The Bengals’ defense just allowed 500+ yards in three consecutive games, an NFL record. Primarily used on gadget plays thus far, Jackson is the only first round rookie QB in this year’s class to not make a start. Jackson, an athletic runner-type, would bring a rush floor with a 5.0 YPC on 28 attempts this season. Ravens HC Harbaugh stated that Flacco doesn’t need to practice this week to be able to play. If Flacco is ruled out, and Jackson is named the starter, then Jackson is most certainly in play. Flacco (hip) is listed as doubtful and hasn’t practiced all week. Harbaugh has not named a starter and may not until Sunday morning. Jackson (illness) missed Thursday’s practice but participated Friday. There’s a chance Robert Griffin III is in the mix for playing time, even if Jackson starts. 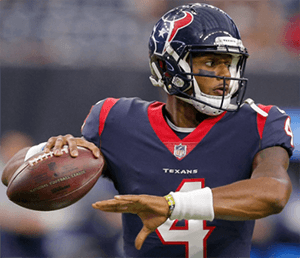 Deshaun Watson (HOU) – Salaries: DraftKings (DK) – 5700, FanDuel (FD) – 7800. Watson’s upcoming salary ranks him 12th/9th on DK/FD, respectively for the position. Watson posted a 17/24, 213, 2:0 line and 6-38-0 on the ground at Denver in week 9. The betting line with Washington lists the game total at 42.5 points with the Texans as -2.5 point road favorites. The Texans’ implied team total is currently at 22.5 points and Washington is currently at 20 points. The Texans are coming off their bye. Washington’s defense ranks 24th against QBs in fantasy points allowed and 17th in DVOA against the pass. Washington also ranks 25th in pass yards allowed per game with 270.1 and 4th (tied) in points allowed with 19.4/gm. Ryan Fitzpatrick put up a 29/41, 406, 0:1 line and 8-35-0 on the ground with a lost fumble against Washington last week. New acquisition, Demaryius Thomas should have a better grasp of the playbook, having been with the team now for two weeks. Watson has a nice setup here as the AFC South leaders should have success through the air in this matchup. Alex Collins (BAL) – Salaries: DraftKings (DK) – 4400, FanDuel (FD) – 6000. Johnson’s upcoming salary ranks him 29th/25th on DK/FD, respectively for the position. The Bengals’ defense ranks 30th against RBs in fantasy points allowed and 30th in DVOA against the run. Despite betting lines not yet posted for this game, the Ravens should end up as home favorites. The positive script should setup well for Collins, who ranks 6th (tied) with 6 rushing TDs. This play is contingent on Lamar Jackson starting. A rookie QB, making his first start, should be heavily reliant on the run game, where Jackson’s style of play and Collins’ role should complement each other well in this defensively challenged, run-friendly matchup against the Bengals. Dion Lewis (TEN) – Salaries: DraftKings (DK) – 4800, FanDuel (FD) – 5900. Lewis’ upcoming salary ranks him 23rd/27th on DK/FD, respectively. Lewis posted a 20-57-0 rush line and 2-11-0 on 2 targets with 49 snaps (75%) against the Patriots last week. The betting line with the Colts has the game total at 48.5 points with the Titans as +2 point road dogs. The Titans’ implied team total is currently at 23.25 points and the Colts are currently at 25.25 points. The Colts’ defense rank 23rd against RBs in fantasy points allowed, 9th in DVOA against the run, and 28th in DVOA against RBs in the pass. Jacksonville RBs combined for a 30-70-1 line and 11-112-1 on 12 targets in Indianapolis last week. Lewis out-snapped (49 to 16) and out-touched (22 to 11) Derrick Henry last week, yet Henry vultured two red zone TDs. This is always a risk to Lewis as Henry has 4 red zone TDs to Lewis’ 2. However, Lewis is the script-proof RB1 despite how the game-flow goes, and should see 20+ touches regardless. Amari Cooper (DAL) – Salaries: DraftKings (DK) – 5400, FanDuel (FD) – 6600. Cooper’s upcoming salary ranks him 28th/22nd on DK/FD, respectively for the position. Cooper posted a 6-75-0 line on 10 targets, and 55 snaps (80%) at Philadelphia last week. The betting line with the Falcons has the game total at 48 points with the Cowboys as +3 point road dogs. The Cowboys’ implied team total is currently at 22.5 points and the Falcons are currently at 25.5 points. The Falcons’ defense ranks 29th against WRs in fantasy points allowed and 29th in DVOA against the pass. The Falcons also rank 30th in pass yards allowed with 294.4/gm and 29th in points allowed with 30.2/gm. In his first two games as a Cowboy, Cooper’s stat line leads the team in all WR categories. He’s getting 9 targets per game during this span and will get his best matchup to date. Larry Fitzgerald (ARI) – Salaries: DraftKings (DK) – 5600, FanDuel (FD) – 5900. Fitzgerald’s upcoming salary ranks him 25th/34th on DK/FD, respectively for the position. Fitzgerald posted a 6-50-0 line on 10 targets and 70 (96%) snaps at Kansas City last week. The betting line with Raiders lists the game total at 40.5 points with the Cardinals as -4 point home favorites. The Cardinals’ implied team total is currently at 22.25 points and the Raiders are currently at 18.25 points. The Raiders’ defense ranks 15th against WRs in fantasy points allowed and 30th in DVOA against the pass. The Chargers’ WRs combined for a 10-103-1 line on 15 targets at Oakland last week. In the past two games since Byron Leftwich assumed offensive play-calling duties, Fitzgerald has averaged 11 targets, 7 catches, and 76 yards per game. Fitz now brings a floor in an unimposing matchup. Corey Davis (TEN) – Salaries: DraftKings (DK) – 5600, FanDuel (FD) – 6200. Davis’ upcoming salary ranks him 25th/31st on DK/FD, respectively for the position. Davis posted a 7-125-1 line with 10 targets (all team highs), and 59 snaps (91%) against the Patriots last week. Davis’ fantasy points of 28.5/22 ranked him 4th/4th on DK/FD, respectively. Davis’ price per point efficiency ranked him 4th/5th on DK/FD, respectively. The Colts’ defense ranks 12th against WRs in fantasy points allowed and 27th in DVOA against the pass. The Colts also rank 24th in pass yards allowed with 268.4/gm and 26th in points allowed with 26.6/gm. Davis has averaged 10 targets per game over his last two. Expect the volume to continue for Davis, especially if this game turns into a shootout on the fast track in Indy. James O’Shaughnessy (JAX) – Salaries: DraftKings (DK) – 2600, FanDuel (FD) – 4000. O’Shaughnessy’s upcoming salary ranks him 26th/56th on DK/FD, respectively for the position. O’Shaughnessy posted a 5-46-0 line on 6 targets and 52 snaps (69%) at Indy last week. O’Shaughnessy’s fantasy points of 9.6/7.1 ranked him 12th/16th on DK/FD, respectively for the position. The betting line with the Steelers has the game total at 47.5 points with the Jaguars as +5.5 point home dogs. The Jaguars’ implied team total is currently at 21 points and the Steelers are currently at 26.5 points. The Steelers’ defense ranks 25th against TEs in fantasy points allowed and 26th in DVOA against TEs. Greg Olsen logged a 4-40-0 line on 6 targets at Pittsburgh last week. O’Shaughnessy (hip) last appeared in week 6 but returned to contribute with a TE respectable 16.7% target share and 18.5% reception share. O’Shaughnessy’s matchup is solid and if the negative script holds, he may see a similar volume to last week as a cheap punt play. Jeff Heuerman (DEN) – Salaries: DraftKings (DK) – 3700, FanDuel (FD) – 5400. Heuerman’s upcoming salary ranks him 14th/14th on DK/FD, respectively for the position. Heuerman posted a 10-83-1 line on 11 targets (all team highs) against the Texans in week 9. The betting line with the Chargers lists the game total at 46.5 with the Broncos as +7 point road dogs. The Broncos’ implied team total is currently at 19.75 points and the Chargers are currently at 26.75 points. The Charger’s defense ranks 10th against TEs in fantasy points allowed and 1st in DVOA against TEs. The Raiders’ TEs put up a combined 5-57-0 line on 12 targets against the Chargers last week. Heuerman saw a season high workload in week 9, which was the first week without Demaryius Thomas. Heuerman has two TDs on the year, both coming in the past two games. The matchup for Denver’s passing game is tough all around, but perhaps Heuerman’s usual volume can uptick if the negative script holds and with Thomas now gone.